I’ve always been interested in the versalitity of video games. Things like computing power, interfaces, graphics, have no inherent purpose to them – they are defined entirely by what the programmers choose to create. And so, while the capabilities afforded to game programmers can make engaging fantasy worlds, they can just as easily be turned to realistic simulations. Simulations that put the user into situations so foreign to them, that they might as well be fantasy themselves – if it weren’t for the fact that they are completely based in reality. Such is the simulation you get here. Life and Death puts you in the scrubs of a first-year resident in the Department of Abdominal Surgery at Toolworks General Hospital. You will be given a steady stream of patients with various abdominal complaints to diagnose, test, refer, or operate on yourself. Regardless of your level of medicinal knowledge, the game endevours to teach you every step of the way, from reams of documentation in the box, to in-game classes showing your exact mistakes in surgery and how to correct them. No one’s going to get a doctorate out of this game, and real surgeons would probably get a chuckle from it, but it takes itself seriously, and brings enough research and veracity to it to convince you to do the same. Don't worry... heh... you're in good hands. Heh. Heh. 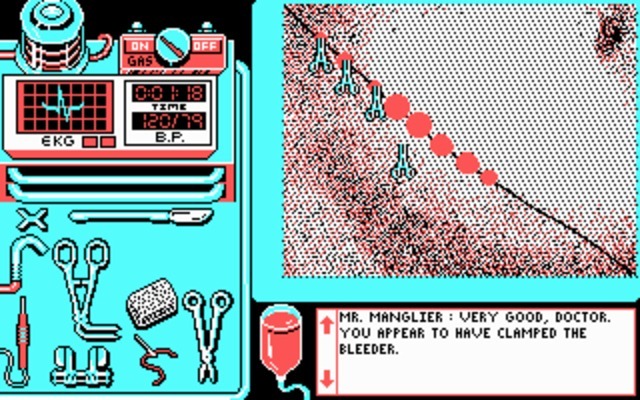 The game thus seems to be more of a surgical simulator, and this section is, appropriately, far more detailed. 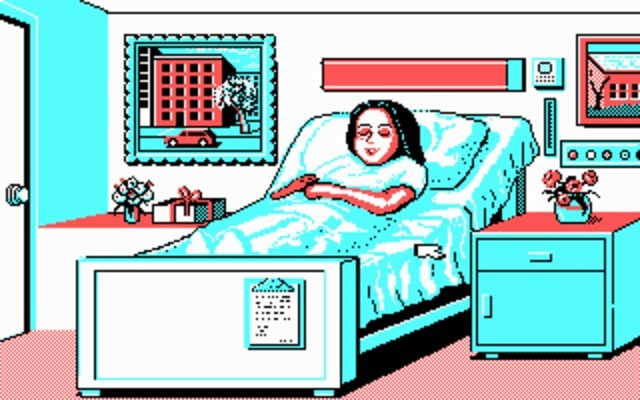 When you enter the OR, the game boots up a second surgery engine (literally drops to DOS and back). Here you’re looking at the affected section of your patient on the right, a table of operating instruments and indicators on the left, and a window with dialogue feedback from your surgical team on the lower right. You can only send patients for two operations – an appendectomy or an aortic graft – but these surgeries are lengthy, multi-stage affairs. At the basic level, you have to cut through layers of skin and muscle to get to the affected organ, perform some specific tasks in a specific order based on the surgery you’re performing, then close and suture the patient in reverse, one level at a time. During all this, you must keep an eye on the patient’s IV fluids, blood pressure, and EKG, and be prepared to quickly administer the appropriate corrective measures should a complication arise. If you’re being careful, you can expect about 15 minutes per surgery, once you have all the steps down. The surgery sections contain the major benefits and unintentional humor of this simulation. You can flip through the manual and skim the steps, you can even have it open and following along on the side, but your first few surgeries will be unconditional disasters. In my first, I had browsed the manual the day before and was so caught up in trying to remember the correct procedures in the hospital sections that I literally forgot what to do when I sent the first patient to the OR. I didn’t scrub, I didn’t administer antibiotics, I didn’t even start a blood transfusion before I began cutting skin. So after making a lengthy cut with the scapel, I sat there, stupified, as blood started oozing out of the incision and their BP fell like a brick. They died from bleeding out as I was “erasing” the blood with the sponge tool because I thought, in my panic, it would give me time to think. Your first patients will die, and they will die frequently. Fortunately, (well, unfortunately for the patients) this is a “teaching hospital,” which apparently means that no matter how many people you kill, you’ll still get another crack at it. Often, when you do very poorly on a surgery, every case you get will then be an appendectomy or a aortic anuerism, essentially allowing you to bypass the hospital section and go right to another surgical attempt with some fresh meat. You will also be forced into the classroom to learn your mistakes, and the instruction you get will be exact and appropriate. Most of the lessons are blocks of text describing proper procedure, but in cases where you need to be shown the exact area to cut a membrane or suture an artery, you will see an image from the surgery circling the exact point you need to act upon. This eliminates all the guesswork of the “cut 5cm to the left of the tip” descriptions in the manual, and actually, and accurately, teaches you how to do the in-game surgeries. The surgery engine is also frighteningly smart, and accurately keeps track of everything you’ve done. As an example, if your incisions aren’t straight enough to promote proper healing, you’ll hear about it in the classroom. If you don’t use enough stitches to close a patient, you’ll hear about it in the classroom. In one case, I had a patient die of a PVC heart arrythmia and was told to inject Lidocaine in that situation – but the class wasn’t over – the next slide was an animated image from my surgery (because I recognized the exact shape of the cut I had made), where I was shown precisely what the offending PVC looked like on the EKG. That was the moment I became really impressed with what the Toolworks crew had accomplished here. Graphics are probably something many would wonder about, as a detailed simulation would certainly make some people squeamish. 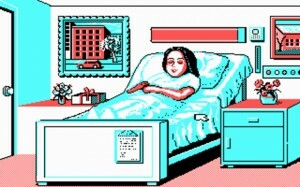 The graphics are EGA with a number of apparently digitized photos for the hospital administrator and the abdomnial closeups. The guts of your patient do not appear to be photos, and EGA isn’t detailed enough to get too slimy. When you cut the first two layers of skin, your patient will bleed in growing circles of red as an indication of “bleeders” to be clamped and cauterized. But no great gouts of gore will come spraying out from your patient, he won’t suddenly rise up in the middle of surgery and puke into the screen, and you won’t find an alien in there to come popping out at an inopportune moment. It’s real enough to make it clear that you’re supposed to be cutting living skin, but not detailed enough to be more than representations of what you would be seeing during an actual surgery. About the only real complaint I can make about the graphics is that, with only 16 colors, you run into problems when your black incision line crosses into black areas the artists have used for shading. It can be a problem when you’re trying to place stitches on that incision later in the surgery. I had to guess far more than I would have liked here, but it’s not too hard to assume where a straight line falls, and the game seemed to accept it regardless. Classroom sections are accurate and helpful. I’m sure another large section of you are wondering what kind of tomfoolery you can get away with, and fear not. I am a thorough reviewer, and I tested these as well. The short answer is that botching a surgery is easy, but never satisfying. I attempted to carve my name into a patient’s chest, but the surgery stopped when it sensed more than two seperate incisions. I turned off the patient’s anesthesia while his abdomen was open and I was holding the end of his intestines in my hand, but that just ended the surgery immediately with a “what were you thinking?” chiding and a classroom explination of the necessity of anesthesia. The game offers a solid simulation of actual surgery, but understandably doesn’t take the time to consider intentional horrors. It does however prove that nothing, absolutely nothing, you can do will get you kicked out of Toolworks General. The only mistake that will end your game is not promptly calling back another doctor’s page, which acts as the copy-protection. Somehow I think killing eight patients in a row would be a more serious offense that not returning a phone call, but I guess that really depends on what state Toolworks General is located in. Controls are mouse-driven, and entirely point and click. You will click on doors to navigate the hospital, click on patients to palpate them, and click on tools to pick them up and use them in surgery. The surgical part actually can be best compared to an image editor. You make incisions with the scalpel by “drawing” a line across the patient. You suction up blood or other fluids by moving the hose around and “erasing” them. Clamps and forceps are set by clicking them to select them, and clicking again to place them. It’s a very intuitive system for the most part, though it sometimes isn’t clear how to clarify that you just want to nick a membrane or scrape it instead of cutting. In these situations, you usually just single-click, and the game accepts that if it’s part of the expected surgical step. You will also be driving the surgery virtually solo. Your assistants will be present and offer confirmation dialogue in the text box, but things they would normally handle like passing you instruments and administering drugs, monitoring IVs, etc are all in your ballpark. Luckily, this is made as easy as possible – you pick up the syringe and click anywhere on the patient to inject drugs, you pick up a bottle and click on the IV to start a new drip. Also worth noting are the handful of recroded digital sounds in the game, something of a rarity for the time. You’ll get an “OW!” from the patient during the exam, some noises from equipment like the cauterizer, and most helpful of all, a steady beep to go with the EKG. This allows you to pay attention to the patient and listen for EKG irregularities, without keeping one eye on each. The only real catch is that only one sound can be played at a time, so if you’re cauterizer is working, it might overwrite the EKG beep. I think the most interesting thing I can say about the game is how, during the course of playing, I transitioned from a haphazard Benny Hill-style surgery, to viewing it as a sequence of natural steps. I presume that actual med students experience this change in thought as well, and it was sort of a revelation to think to myself “Oh, now I see how surgeons are mentally able to get over cutting into a person and do this on a daily basis.” After doing a number of successful in-game appendectomies, I’m certainly not going to be able to jump into any in real life, but I came away with a better understanding of surgery and the process for it, with some of the mystery and/or fear taken away. They’re just doing their jobs, and that’s probably the main thing Toolworks wanted you to take away from the game. In that respect, and in many others, they succeeded. Very interesting surgical simulation, well researched, well thought out. The effort put into teaching the player is commendable. Only two surgeries you can perform, hospital/patient sections aren’t as fully-featured, and serve mostly to bookend the surgeries.